Heat oven to 350ºF. Line 13x9-inch pan with foil; spray bottom only with nonstick cooking spray. Prepare brownie mixes as directed on package, using oil, water and eggs. Spread in sprayed foil-lined pan. Bake at 350ºF. for 28 to 30 minutes. DO NOT OVERBAKE. Cool in pan on wire rack for 1 hour. While brownies are cooling, place 1/2 cup of the whipping cream in small saucepan. Sprinkle gelatin over cream; let stand 5 minutes to soften. Heat over low heat for 2 to 3 minutes or until gelatin has dissolved, stirring occasionally. Remove from heat. Stir in half of the crushed candies. Cool 20 to 25 minutes or until lukewarm, stirring occasionally. Most of candy will melt. Beat remaining 1 1/2 cups whipping cream in large bowl until stiff peaks form. Fold in remaining half of crushed candies. Working quickly, stir 1/4 of whipped cream mixture into gelatin mixture. Fold gelatin mixture into remaining whipped cream until blended. Spread whipped cream mixture over cooled brownies. Cover; refrigerate at least 1 hour or until serving time. 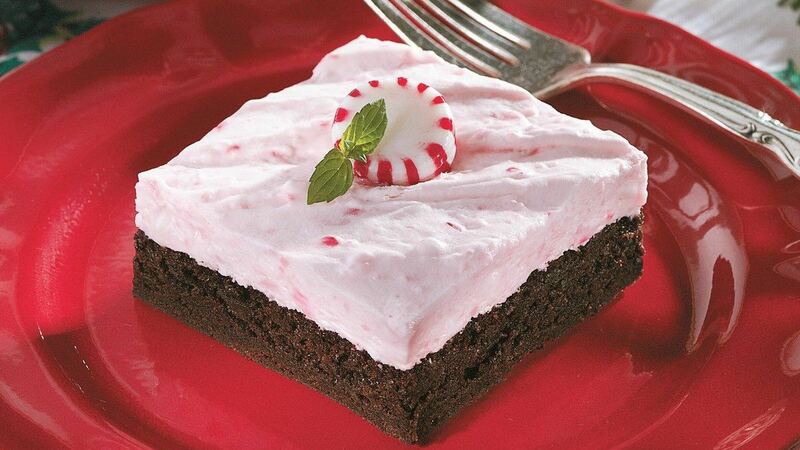 To serve, using foil lift dessert from pan; cut into squares. Top each with whole peppermint candy.